The Urban leadership Foundation of Colorado brings light to local teen’s stories with: A Night at the Theater – The Story of an American Teen. 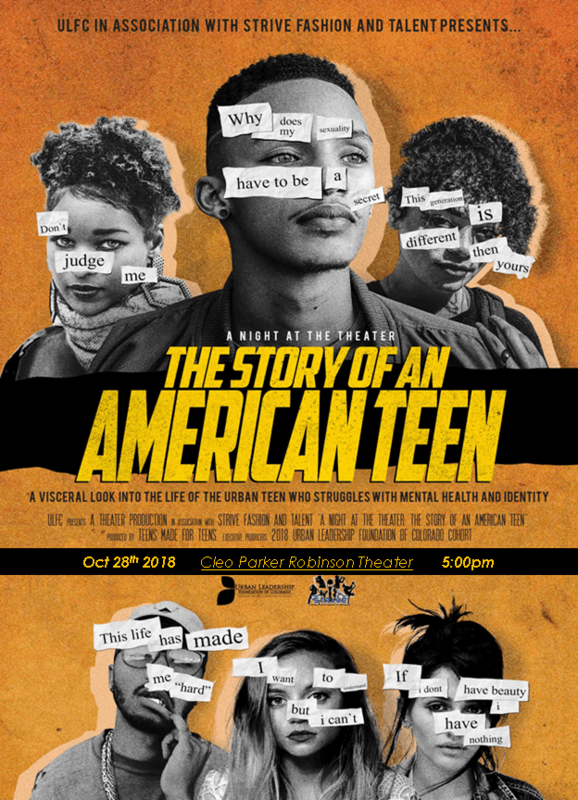 On October 28th 2018, at the historic Cleo Parker Robinson Theater, the curtain will rise and light will be shed on the challenges real teens face in a play written by, produced by, and starring teens. In addition, our young actors and actresses will share the stage with a special celebrity guest! Teens live in a world that is drastically different from previous generations. Marijuana is normalized, bullycide is at an all-time high, school shootings are a common news story, and social media has enhanced peer pressure drastically. More than ever, teens need support and a platform to speak their truth. This is a community-focused event where young people, parents, and teachers will see stories inspired by teen’s truthful experiences play out in live theater.